Although there are many negotiation tools and strategies, the single most important lever is confidence from having a Best Alternative to a Negotiated Agreement (BATNA). Which is the best of the best according to Physician On Fire? Financial Independence of course. Have financial security to not have to give into consensions during a contract negotiation will give you the most confidence over any other trick. So what is financial independence and can it solve other problems plaguing healthcare? This podcast is intended for new graduates who are just starting out and have questions about student loan debt, signing bonuses, how to keep a low tax burden and geographic arbitrage. This then gives negotiating room to ask for a part-time job or transition out of medicine entirely. 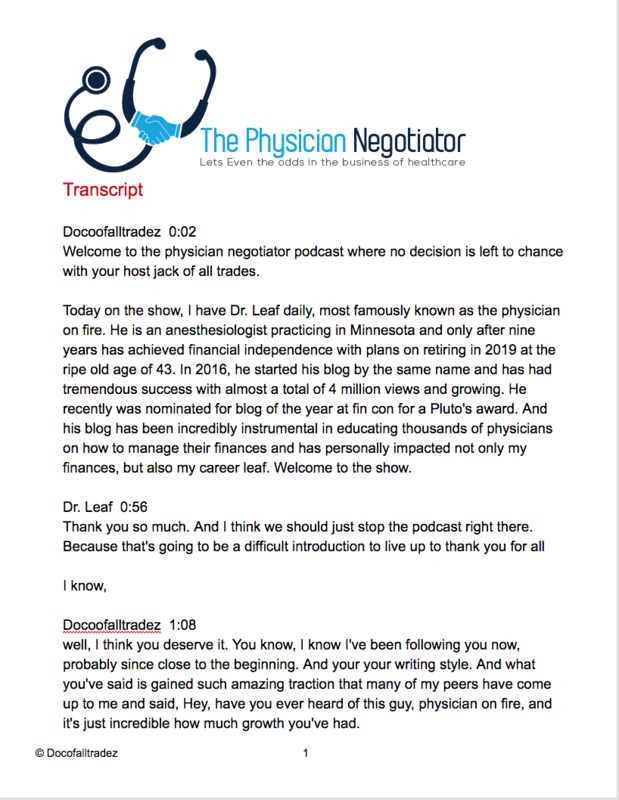 Some people call medicine a calling and even though he has been criticized for wanting to retire early, at the end of the day Medicine is a business and we as physicians have free will. POF used to help only one patient at a time. Now that he has a blog with thousands of page views amazing advice he can help many more than practicing medicine. His final advice on the recent and ongoing stock market correction; Stay the course, recognize that this will be a buying opportunity which will help you get ahead.